Exerts an antioxidant and free radical neutralizing effect. 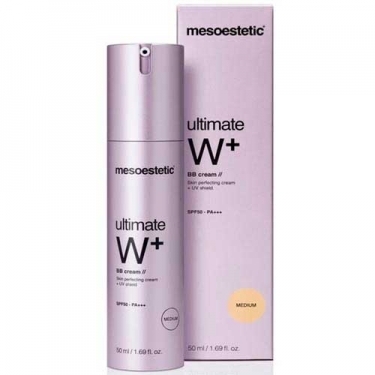 DESCRIPTION: Ultimate W+ BB Cream SPF 50 from Mesoestetic is a multi-purpose cream that combines the power of hydration and the high protection of a treatment product with the optimizing properties of a makeup base, uniting and instantly illuminating the skin tone naturally. It guarantees a maximum photo protection, homogeneous and constant against the UVA and UVB rays, thanks to its antioxidant agents and the combination of physical and chemical filters. It reduces skin blemishes and imperfections, as well as preventing and fighting the appearance of wrinkles and lines of expression. Apply daily after the usual cream treatment; Spread with your fingertips or a sponge from the center of the face outward, slipping the product evenly.